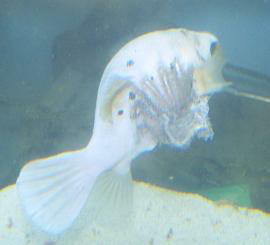 I read all of the posts on puffers and disease and didn't see pictures that looked like this. crab in a 6 inch Triton shell. Tonight when I got home I noticed a mark on my Porcupine puffer Kirby. it is whitish/pink area. It is about an 1/2 inch wide by a little under an inch long. I have attached a picture. It doesn't look like ich or velvet or other diseases I have seen first hand. I am wondering it it looks fungal or bacterial in nature to you? Or if it looks like a wound perhaps inflicted by a rather large crab living in a triton shell. Any thoughts? I can quarantine Kirby the puffer and medicate him if need be. I would rather not medicate him if it is a wound that will heal on its own. Kirby is 6 years old. He doesn't seem lethargic at all or breathing fast either. He is eating well. Are there bacteria's or fungus that move this quickly in less then 24 hours? Thanks for your help this is an amazing site. "<how is NO3 rendered thus?>"
I have a refugium stuffed full of plants, a nitrate filter from Aquaripure and religious water changes because puffers are really messy. Maybe how I should have phrased it is that the nitrates are undetectable with 2 different test kits. So I think it is a combination of all three things. There must be a titch of NO3 as the plants are doing fine but I think the plants take up what is left by the puffers messy eating habits. The NO3 with 2 different tests it is not detectable. 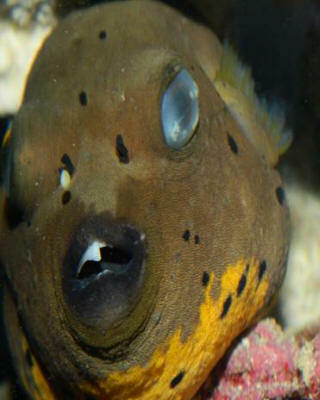 I definitely think the puffer was wounded by Roger Rabbit fish or the Dardanus crab. I am kind of leaning toward the crab. Kirby the puffer seems to be giving the crab a wider leeway and to some degree avoiding the area where the crab is. I do not remember him doing that before. Thanks again for this site. It is a treasure trove of knowledge. I have spent many hours reading your various posts and I hope some of the information has stuck! In particular I have been reading the puffer sections as I have what I believe to be a matched pair of Arothron Meleagris. The larger of the 2 is golden in colour and a real character often squirting me with water at feeding time. They are my pride and joy and currently live in a 150 gallon FOWLR tank. 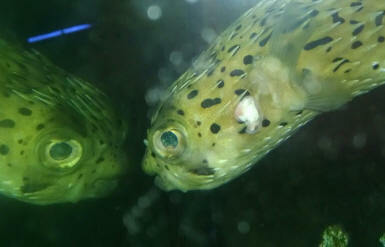 I noticed yesterday that golden puffer had a fin trapped in its gill and it is still like this today. He seems ok and is swimming and eating however obviously one gill is permanently shut which in turn has trapped the fin. I read on another post from somebody else that Bob recommend that I should try to intervene and remove the fin. What I am worried about is damaging the fin or the gill and is there a particular way I should try to remove the fin or is it a case of just trying to pull it out? I have an approximately 8 inch Dog Face Puffer with an unusual problem. 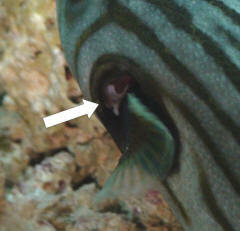 When he exhales there is a small balloon of what looks like gill tissue expanding out of one gill slit. The tissue expands and contracts with his breathing. Any idea of what this might be, and how to treat it. 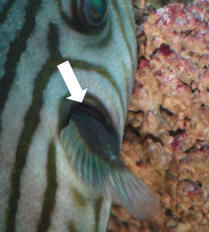 There's a query today about a sickly Arothron mappa... not eaten much, yet has a swollen belly. Can you shed any light? My initial reply is on today's (22nd Dec) FAQ page, but there are a couple of follow-ups in the Sent Items folder ready for tomorrow's batch of FAQs. I agree with you and Bob - it's probably just from eating and needs a bit of time. How right you are about map puffers not being community fish! I had one live peacefully with a bamboo shark for ~6 months, and one day completely rip it apart. Learned the hard way to keep it totally by itself! Thanks for this. I hope Bob's able to roll this into the Daily FAQs. These puffers do sound to be like the freshwater Tetraodon mbu: much too large to keep at home, and far less predictable in terms of behaviour than other puffers (and even the best puffers aren't exactly easy going!). I was doing a shop tour a month or so back, and this one particular place had something like a dozen Tetraodon mbu on sale. 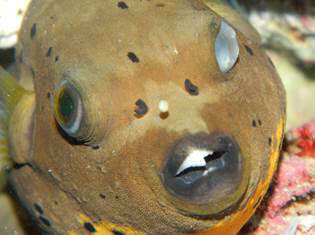 I can't imagine there are that many public aquaria in this country for such pufferfish, let alone hobbyists. Insanity (and I said so in the article!). UK is having an unusually cold winter with lots of snow. My home town looks very pretty (some photos on my Facebook page). Economy still in the doldrums without many signs of recovery just yet. Fingers crossed, I suppose, that things get better quickly. On the other hand, mustn't grumble. Looking forward to flying to Omaha on the 26th, and then spending a couple of days in Dana Point and then another couple days in Minneapolis, where I'll be giving two talks to a fish club there. To the both of you, enjoy the Christmas break.